Iraq and its neighbours have said the US-led occupation forces must withdraw from Iraq as soon as possible. At an unprecedented regional summit in Kuwait, they also urged the UN to play a greater role in post-war Iraq. Iraq also said it would press the US to hand Saddam Hussein over after the transfer of power and to change his prisoner of war status to face trial. Meanwhile, top US administrator in Iraq Paul Bremer said Washington was open to new ideas on the transfer of power. But speaking on American television, Mr Bremer stressed the US remained committed to 30 June as the target handover date. The US plans to hold a series of regional caucuses to choose the new government have been denounced by the spiritual leader of Iraq's Shia majority, Ayatollah Ali al-Sistani, who demands direct elections. Mr Bremer said there were dozens of ideas around - including partial elections or a national conference - but gave no further details. Instead, he said he would wait to hear the report of the UN envoy to Iraq, Lakhdar Brahimi, on his recent visit to assess the feasibility of elections. Mr Brahimi is expected to give his recommendations to UN Secretary General Kofi Annan in a week or so. The regional summit brought together Iraq and the six countries which border it, plus Egypt, for two days of talks in Kuwait. The group had met four times since US-led forces overthrew Saddam Hussein last April, but this was the first time Iraq was invited. The final communique called for the UN to assume "central responsibilities" in Iraq's transition. The proposed UN role would include giving advice and expertise on formulating a new constitution, holding elections and completing the transfer of power. The UN pulled out of Iraq last August after a bomb killed 22 people at its Baghdad HQ. Iraqi Foreign Minister Hoshyar Zebari told his counterparts that the US-backed authorities in Baghdad wanted the UN to return to Iraq and resume its work. Mr Zebari also said Iraq would ask the US to hand Saddam Hussein to the Iraqis. "We will demand changing his (Saddam's) status and handing him over to Iraqi justice to put him on trial," Mr Zebari said. After his capture in December, the US declared the former Iraqi president a POW, meaning he has certain specific rights under the Geneva Convention. The move has triggered protests among many Iraqis who are demanding Saddam's immediate trial in Iraq, with a death sentence as the ultimate sanction. Washington has said it wants an Iraqi court to try Saddam, who is currently being held in the US custody. POW status does not preclude prosecution. The summit communique also said it was vital to eliminate "all terrorist and other armed groups from Iraqi territory that constitute a danger for the neighbouring states". Mr Zebari said Iraq and several of its neighbours had agreed to control borders more effectively. He had earlier urged neighbouring states to tighten their border controls, following the latest attack on Iraqi security targets. The BBC's Jonny Diamond in Baghdad says some of the country's neighbours bridle at suggestions that they are allowing foreign fighters to cross their borders into Iraq. On Saturday, at least 27 people died when gunmen attacked a police post in the Iraqi town of Falluja. Four attackers were among those killed. 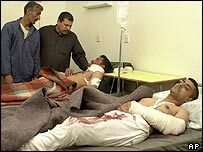 The daylight raid in the flashpoint town was the third major attack on Iraqi defence forces this week, following bombings that left around 100 people dead. "The UN still has to report on whether early elections are possible"